Over the course of my senior year in college, I’ve been hard at work on a visual novel dubbed Streams of Nurture (hence the conspicuous gap between published articles since August 2016). As both a passion project and academic piece, Streams of Nurture represents an interesting case study for transforming one of my most ancient interests, food production, into an interactive affair that combines the dramatic qualities of an entertainment title with a real-world topic characteristic of serious games. In other words, I wanted to leverage the concept of “learning through play” to create a title that felt both purposeful and engrossing. With my project officially submitted to the Worcester Polytechnic Institute database, I can now share with you the report detailing the development cycle for the visual novel. Throughout the coming weeks, I shall be publishing a subsection of the report penned for Streams of Nurture. Each part will focus on a particular design and production aspect of the game, from the way the narrative was conceived to the iterative art process that governed the title’s presentation. This first post in a series of game development articles explains the conceptual and research phases that preceded the actual development of Streams of Nurture. NOTE: I didn’t single-handedly develop the game myself. Although I handled the narrative design, coding and writing for Streams of Nurture, my partners Liam Miller and Dave Allen were wholly responsible for the art and audio respectively. As such, the pronoun “we” will be used to acknowledge their invaluable contribution to this project. Streams of Nurture is a kinetic visual novel that tackles the topic of salmon aquaculture (fish farming), as well as the socioeconomics and cultural factors surrounding the species and the communities who depend on it as both a food source and a symbol of their historical roots. The game relates the fictional tale of a New Englander who relocates to Washington State to attend Labrador Institute and continue the work of their father, who mysteriously vanished when the protagonist was a toddler. One day, a salmon crisis breaks out, and the plucky Northeasterner and their new friends set out to make things right by adopting sustainable rearing practices that will preserve the wild fish stocks. Along the way, they encounter the quandaries associated with pursuing innovative but potentially beneficial ventures. At a certain point in the game, players must choose between three different branches that correspond to the farming methods proposed by their in-game allies. Following that decision, the player proceeds through the various stages of the salmon’s life cycle in a controlled environment, learning how to take proper care of the fish with regards to feeding them and monitoring the conditions in which they are being kept. The goal of this project was to present an important topic seldom explored by the video game medium, while weaving a dramatic and personal narrative that touches on the flaws and relationships of the game’s characters. The idea of creating this project came about when we were contacted by Professors Brian Moriarty and Ralph Sutter in early August 2016 about designing a visual novel for our Major Qualifying Project (MQP), the possibility of which they had pitched the previous academic year (2015-16). Around that time, we were pondering the idea of creating an educational entertainment (“edutainment”) title that covered topics which had occupied our attention for several years: food production and nutrition. As children, we had developed an interest in pursuing a healthy and varied diet, leading us to visit the supermarket as well as food processing factories in our spare time (see Figure 1). Figure 1. Salmon curing plant (H. Forman & Son). We had also become conscious of the wider cultural, economic, political and economic processes surrounding our dietary choices, and had begun practicing “green consumerism” by researching the food items we purchased on a daily basis, paying particular attention to the way their ingredients were harvested (see Figure 2). Figure 2. Farm-raised Norwegian salmon for sale. By the time we were invited by Moriarty and Sutter to partake in their proposed project, we felt confident in our ability to do justice to our chosen topic by building a game that would inform players of the methods and practices by which our sources of sustenance are obtained. Following conversations with our Professors, we proceeded to generate potential concepts for a visual novel based on our interests in the food industry and healthy eating. Over the course of a week, we came up with several potential premises for the project. These ranged from a jet-set adventure that would see players learn more about the various food groups anthropomorphized as eclectic deities (akin to Sheogorath from the Elder Scrolls video game series, and his obsession with cheese), to an experience that would revolve around consumers pressuring companies to seek deforestation-free sources of palm oil. After much deliberation, however, we settled on a topic that we felt would be unique enough to stand out from similar edutainment titles. That topic was aquaculture (fish farming), more specifically the type that deals with the year-round rearing of salmon (see Figure 3), especially given that the global production of seafood has more than doubled over the past few decades. Figure 3. Norwegian aquaculturist holding an Atlantic salmon. There were several reasons we chose this topic from the others we brainstormed. First, the team grew up eating all kinds of seafood, and salmon happened to be one of our favorites for its beneficial omega-3 content that provide potent antioxidation, and the broad range of species that span the Pacific and Atlantic Oceans. Second, the industry around that specific fish was the subject of much interest and criticism surrounding its practices and geographical reach, with main producing regions such as Norway, Scotland, Chile, Australia and Canada harboring farming operations dedicated solely to salmon. Finally, salmon possess an extensive commercial and cultural history that can be traced back to numerous fishing communities around the globe. We particularly looked at native populations in the Arctic and North America, whose heavy consumption of seafood led to increased awareness of their health benefits, as well as their impact and influence on the cultures, intertribal interactions, fishing technologies, and very religions of the tribes. After deciding the topic for the project, we dedicated the latter half of August 2016 to researching the methods, socioeconomics, ethics and history of aquaculture. These ran the gamut of hatchery programs in coastal basins, salmon species, real-life fishing towns, and the various corporations that specialized in raising salmon such as Marine Harvest, Cermaq, and Greig. For the setting, we gathered of information on coastal regions that emphasize the value of seafood to their communities such as New England, Alaska, and the Canadian Maritimes. Ultimately, though, we focused on the Pacific Northwest (see Figure 4) for its wide variety of fish stocks and farming sites, with countless rivers, creeks, and streams offering spawning beds to five salmon species. Figure 4. Picturesque view of the Pacific Northwest. The Pacific Coast is also the homeland of Native American populaces whose history and culture are defined by their environment and the fauna that inhabit it. These include salmon, a species prized by tribes such as the Coast Salish peoples of Puget Sound and the Strait of Georgia who once depended on the fish as a source of food, wealth, trade and identity (see Figure 5) and came to identify themselves as the ‘salmon people’. Their traditional fishing practices were deeply shaped by their reverence for salmon, which were seen as gift-bearing relatives, and were treated with great respect, since all living things were once people according to traditional Coast Salish beliefs. Figure 5. Salmon on a stick, a time-honored Native American cooking method. In addition to collecting research notes, we frequented local grocery stores and restaurants, including Price Chopper and the Sole Proprietor, to purchase and assess the taste profiles of different kinds of commercially available salmon such as Atlantic and Pacific king salmon (see Figure 6). Given the impact different farming practices have on the juiciness and flavor of the fish, we believed this hands-on experience would allow us to better understand and communicate the multifaceted nature of salmon from both a commercial and gastronomical standpoint. Figure 6. Ora King Salmon, as served by the Sole Proprietor, Worcester MA. Original photo by Michel Sabbagh. Along with the documentation the team gathered in August 2016, we decided to get our hands on various items and publications pertaining to seafood sustainability, hoping to further educate ourselves on the details of salmon farming and sourcing. Figure 7. Sustainably farmed and fished salmon. The first products we purchased were smoked Atlantic and canned Pacific salmon at Price Chopper (see Figure 7), with the former serving as a major inspiration for one of the routes the player may take in the final game. In fact, the Norwegian farms of Kvarøy and Selsøyvik from which Blue Circle salmon originate are at the forefront of sustainable aquaculture. Their innovative use of lumpfish allows them to keep their farming sites clean and remove deadly parasites such as sea lice without resorting to pesticides or chemicals. Their use of In the Blue fish feed, which reduces pressure on marine resources and minimizes environmental contaminants, inspired us to get our hands on a few samples of actual salmon farming equipment. We acquired a bag of feed pellets from Skretting (see Figure 8), a firm which specializes in the manufacture of high energy pelleted fish feed for commercial fish farms. Figure 8. Fish feed pellets. We also obtained other publications and objects pertaining to seafood to bolster the realism of our visual novel. Plush toys representing three of the most popular commercial salmon proved genuinely helpful (and cuddly) in assessing the general anatomy and physique of the different species (see Figure 9). A variety of books detailed the history, habitat and preparation of the fish, with the taste profiles and nutritional facts for each of the salmon species being explicitly described in one of the seafood handbooks. Information and inspiration from these reference items found their way into the story and dialog of our game, adding to the authenticity and “flavor” of the player experience. As our research notes became broader and more elaborate, we realized that we would have trouble fitting all of the aquacultural information we had scavenged into a single game. Both the potential scope of the project and various routes the player could take to learn more about the farming methods had to be taken into account to understand the implications of fitting all of our findings into the game. It became clear that we needed to prioritize some facts over others to get across the essential facts about salmon farming, or risk the story becoming obtuse or hollow. As a result, the team decided to create a priority list with Excel to sort and color-code our research according to its relevance and importance in the game’s prologue and branching paths (see Figure 10). Figure 10. Priority list with color-coded facts. Many facts were general enough to be applied to the story regardless of which route the player took in their play-through (e.g. 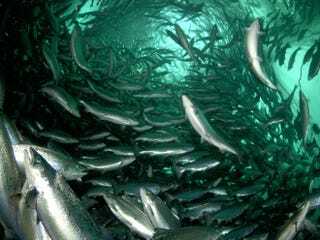 handling and management of Atlantic salmon brood stocks). Other details were either restricted to particular branches, or deemed too esoteric (e.g. average water temperature maintained at 15-16°C). We eventually divided our research into primary, secondary and tertiary categories. All primary and (when possible) secondary elements were prioritized for incorporation into the story to ensure that players would understand the basic processes of raising salmon. Tertiary information was assigned to optional dialog trees or in-game reference sources. This priority list helped us manage the scope of the project, which might otherwise have become bloated with unnecessary detail that would hamper both the development and pacing of the story. Of all the design choices made before development of the project began in earnest, the choice of game engine was the most straightforward. Because we wanted Streams of Nurture to be a simple-to-navigate title that would lucidly depict its subject matter, we agreed that the Ren’Py visual novel engine would effectively suit the technical and narrative needs of the project (see Figure 11). Figure 11. Sample Ren’Py tutorial screen. There are two reasons Ren’Py was selected as the engine for our project. Based on prior classroom experience, we knew it was one of the most forgiving and malleable game engines available for the development of visual novels. Its screenplay-like scripting syntax, combined with ample documentation and tutorials available both online and in the engine itself, would greatly ease the creation and editing of content. The other reason we chose Ren’Py was that one of our team members, Michel Sabbagh, had gained substantial familiarity with the engine by using it to single-handedly develop an original visual novel, Make Love, Not Politics (see Figure 12) during the summer of 2015. Figure 12. Screen shot from Make Love, Not Politics (2015). From the outset, we knew that our project was ambitious. Its complex, wide-ranging subject matter, combined with a dramatic, multi-branching storyline exploring the intimate traits and relationships of several characters, would be impossible to implement without careful planning. Our decision to begin the brainstorming, research and documentation processes before the start of the 2016-17 academic year proved essential in solidifying a manageable structure for the project. Without this preparatory period, the project would have suffered from a lack of visionary focus that would undoubtedly have compromised the efficiency of the production phase and quality of the final delivery. And that’s all she wrote (for Part I, at least)! As I mentioned before, more parts will be posted on a weekly basis.